To start on the north or upper half, go Staunton VA on interstate 81 and then head east on interstate 64 towards Waynesboro or Afton VA. Look for and follow the Blue Ridge Parkway signs. To start in the middle you should go to Wytheville VA on I-81 and then get on I-77 heading southeast toward the town of Fancy Gap VA (its exit #8 off of I-77). Look for the Blue Ridge parkway signs. Or to start at the lower/southern end (and then heading north) go to the town of Cherokee (just southeast of the Great Smoky Mountain National Park) or you can get on the Blue Ridge Parkway in Asheville NC as well. The upper half (the longer of the two halves) of this road runs from Afton VA, (near Waynesboro and Staunton, VA) south till it intersects I-77. This part of the road ambles through the Virginia country side with several sites to stop such as an old mill pond with a working millwheel and some Civil War battle sites. The lower half runs from I-77 (near a VA town called Fancy Gap) to Cherokee NC. This part of the road is mostly in the great Smokey Mountains of North Carolina. There are numerous overlooks to view the beautiful Smokey Mts. as well as several outstanding places to see such as blowing rock and an old plantation house turned into a craft house. The part below Ashville NC is perhaps the most awesome Mt views anywhere in the eastern part of the country and terminates at the Cherokee Indian reservation where a museum and an outdoor drama are well worth seeing. The federal government hosts a very nice informational website covering the Blue Ridge Parkway. One of the best parts of this road is the limited access. The only trucks ever encountered are the few service truck that service the two service station/restaurant areas along the parkway. Another plus is the 45 mph limit that allows you to see the surrounding scenery with out so much risk of having an accident. The road itself is very well maintained and the many curves are gentle. There is one service station/restaurant area on each half of the parkway. The upper one also has a Mt motel that is very reasonably priced but doesn't offer TV. There are several pull off areas where numerous sites can be viewed. There are no signs along the parkway so it is a good idea to try to have a map so that you can tell where the small towns are along the way and where food and lodging are available. The Blue Ridge Parkway, follows a very meticulous winding path from Afton, Virginia down to Cherokee, North Carolina. It is such a winding path that it exceeds the number of way-points allowed by our mapping system and so I refer you to the official US government Blue Ridge Parkway Map. - You can read an interesting FAQ about the Blue Ridge Parkway. on October 8, 2010 20 out of 22 members found this review useful. My favorite ride. From the north, do it my way: from Pittsburgh (or from wherever you begin) to Maggie Valley via slab, just get it done - day two starts the fun. Tons of cheap no frills rooms in Maggie. I do it this way to insure that I get to ride the BRP south of Asheville. This portion is NOT to be missed. Seriously. I mean it, it's my reason for the trip! Day two: up early, big breakfast in Maggie and now we begin! Up the mountain to the BRP, head south to Cherokee, turn her around at southern terminus and... point her north. You now have 570 miles of unimpeded motorcycle bliss, including Skyline Drive, ahead of your front tyre. Plenty of places to camp along the way, (my preference) or if your old bones need a mattress, lotsa towns off the mountain en-route. Take a map, figure it out. There are no bad choices here. Isn't this why you ride? I allow two long days to complete the BRP including some photos, a little hiking, a coffee stop at Pisgah Inn, and chile at Mount Mitchell. I camp along the road and do my best to not leave the mountains. Allow three if you want to really savor the trip. From Front Royal (top of Skyline) I can get home without touching the interstate via Va50, Md42, Pa51 etc. Consult that map. One day covers my route from Waynesboro (bottom of Skyline) to Pittsburgh. Trust me on this, I've done it spring and fall for years. If you want to add the Dragon, figure a day for Maggie-Dragon-Maggie. Maps don't look like it, but you need a full day. Check out rt28 to Fontana dam while you're in the neighborhood. If you have the time, explore western NC - great roads, great people, great views, great food. Consult that map, pick some squiggly lines, again there are no bad choices. Wheels Thru Time Motorcycle Museum in Maggie is worth a look too. Another thing to consider - if you have complications or uncertainties at home, at no time during this ride are you more than one day's (hard) ride from Pittsburgh via interstate. I know, I know... not all you guys are from the 'burgh, but this should be illustrative for all east coast folks! I realize that this was supposed to be about the southern BRP, but there is too much along the way that you don't want to miss. Burn a couple extra sick days, you won't regret it. (The only things that I regret are the things that I did NOT do, rides that I didn't take, philosophically ... burn the days... And look for the red Triumph SprintST. I think they only built one, and we'll be on the Parkway! on March 13, 2011 11 out of 15 members found this review useful. The BRP is The Best Ride you can do on the east coast ! Bar none. I've been riding this great road annually , or more, for almost 30 years. Cannot be beat for road quality, scenery,or any other way you can judge it. Many times I have ridden for a hundred miles at a " spirited pace " and never seen a car! Where else can you do that on the east coast? Always able to find lodging and good places to eat without a problem. The Park Rangers have been less tolerant of bikes the last year or two, but if you use some common sense and ride carefully thru the congested areas you shouldn't have any trouble. Stay focused on the road if you are there for THE RIDE. Stop and take pics if you want to enjoy the view. There is little room for error, but it's worth it EVERY time ! The southern end is the best in my opinion and there are a ton of great roads once you get to the Smokey's. Try to allow some time to explore the southern end if you can, It's Exceptional too. Once you ride the BRP you will wish you didn't wait so long to ride it! Keep your knees in the breeze. on December 7, 2010 7 out of 10 members found this review useful. on July 13, 2013 5 out of 6 members found this review useful. My brother and I have ridden the Blue Ridge Parkway from end to end and it was great! Vary relaxing, plenty of scenary, so many places to stop and take in! Great cruising speed, mostly 45 MPH, tunnels, roads hanging off the mountain, you get it all! Plan your trip for the places you want to stop and see and for you motels! They are always bringing up the thought of "Banning Motorcycles" because of the speeding, so please give a good showing for us as you enjoy the views and the ride! ! on August 9, 2010 5 out of 9 members found this review useful. This stretch of road rates as the most enjoyable ride I have had on a motorcycle. Came that far south en route to ride the Dragon. The Blue Ridge Parkway was in no way comparible. The skyway has it all. Great views, good roads, nice people, and only ran into one cop for the whole 469 miles. From mile 0 to about 120 is awesome in the morning when you can open up the throttle. Then it becomes more of a cruiser style road but the last 150 miles are awesome again with magnificent views and an ever changing environment to ride in. For a good days ride this is it. The only thing that could make this ride more enjoyable would be to tell the Harley people to wave the faster riders through when safe. The groups of 8 to 15 riders that go out together (usually on Harleys) and just idle through it all can be a little annoying. Throw a brother a bone and wave us through when clear. on February 15, 2014 4 out of 4 members found this review useful. Beautiful scenery as long as it isn't cloudy or foggy. At the higher elevation it is a terrible ride when you have to ride in the clouds. I've done it twice that way, and once when it was clear and sunny. If you have the chance to pick a sunny day it's a very beautiful ride. Don't ride if you tend to be in a hurry. Very few amenities on the Parkway, but a lot of pull-offs. Be sure to have a full tank of fuel before you start. on July 12, 2014 3 out of 5 members found this review useful. on April 27, 2012 3 out of 3 members found this review useful. I did this back in 2006, it is one of the best roads for motorcycles, I will do it again, I remeber taking a detour and going to Boone for lunch, the best twisty roads of the whole area (saw a couple of low sides there, be careful. Try to do it before you check out from this world. Also try to take at least 2 days on the parkway. on November 3, 2016 2 out of 2 members found this review useful. The first 1/3 (Cherokee to Asheville) is absolutely incredible! I mean breathtaking views, the tunnels, the turns. I couldn't believe I was actually doing it. The middle 1/3 really flattens out a lot. Instead of mountains and trees you start seeing more farms and houses. I saw the backs of people's houses and started wondering if I was still on track. The last 1/3 get's nice again, maybe around Roanoke on. It's not as nice as the 1st 1/3 but I was still glad to be doing it. If you are set on saying you rode all 469 mi by all means ride it. But there are a lot nicer routes around the middle section. Or jump on 221 (I could see the 4 lane state hwy while sitting in the BRP one lane construction) and skip middle section entirely, giving yourself a time to check out Cherohala Skwy/Deals Gap/Moonshiner 28/NC 151/KY 421 or go see things like Looking Glass Falls. I think you see where this is going. I'm still rating it 5 stars just for that first section alone. The journey is yours to enjoy as you will, so please don't let this review discourage you from riding it all. I came down from Chicago so had to make the most of my time, ymmv. Check the official BRP website or talk to locals about closures/construction. Be prepared for temps 20F cooler than what the lower cities predict. Be prepared for temps fluctuating 20F depending on the altitude or time of day. Bring quality rain gear! Have good working fog lights! I crept up on some small cars and was amazed how close I got before I could see their tail lights. Then realized my bikes taillights are smaller than theirs. So I'd hit a pull-off and have some coffee and wait it out. Generally the fog doesn't burn off til 10'ish. on July 8, 2016 2 out of 2 members found this review useful. Excellent ride, just be open to adjusting your route some. 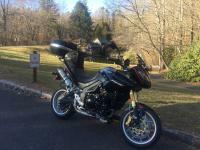 I went into the trip with anticipation of riding the entire BRP from end to end as well as Skyline Drive. I started near Cherokee NC and did it backwards. The first 1/3 was AWESOME! You hit the 3600ft elevation and it's the most scenic portion of the trip. A bit after Asheville it starts to flatten out and is mostly farms. So you go from being on the top of mt's to seeing horses and peoples homes. After Roanoke the last 1/3 gets scenic again. If your heart isn't set on riding all 460 miles of the Blue Ridge there are some nicer roads nearby during that middle third of it. All in all it was a fantastic trip and doing it in 3 or 4 days didn't leave me enough time to see half of the sites around. You have to come down off the ridge if you want to see things like Looking Glass Falls, so plan accordingly, take your time and enjoy yourself. on September 2, 2014 2 out of 2 members found this review useful. For sheer beauty you can not beat the Parkway. The country is awe inspiring. In the fall the colors are breathtaking. The North Carolina part is the best! on July 4, 2014 2 out of 2 members found this review useful. I road all 469 miles on my way home from Run to the Wall 2014, the weather was perfect, the traffic was light,incredible experience, the man who built that road was a motorcycle lover. I hope to do it again one day soon. on February 10, 2013 2 out of 3 members found this review useful. I've read the many comments made by riders about this route. One is that the scenery can become monotonous. That is true. But it is also reassuring to know what type of roadway, what type of pulloffs, what type of tourist towns, what type of hills, etc., one is going to encounter. It is reassuring to know what to expect so you can just luxuriate in knowing you won't have trucks, pedestrians, and rush hour traffic. The most traffic is around some larger towns and some rest areas only. I found that I enjoyed riding for one day, then to stop at a B&B for a couple of days and explore side roads at leisure. on January 26, 2012 2 out of 3 members found this review useful. As noted by other reviews, the southern portion of the BRP is not to be missed. By far the most beautiful. From WV we took a 7 day trip, used 2 lane highways to get to Tennessee, crossed the Smokies and then rode the BRP from the southern terminus to the northern. Of course stopping along the way at numerous attractions. Especially "The Diamondback" at Little Switzerland. Did the short 16 mile loop. It's awesome ! Even had three days to make our way back through the mountains of WV before ending our 1400 mile trip. on December 5, 2011 2 out of 2 members found this review useful. Since June, 2008 I've logged almost 70,000 miles on this bike crisscrossing the lower forty-eight. And the lower section of the Blue Ridge Parkway, Fancy Gap, Virginia to Cherokee, North Carolina is tops east of the Mississippi River. Fine ridge and great people! on October 6, 2011 2 out of 3 members found this review useful. on April 25, 2010 2 out of 2 members found this review useful. Cannot rate this ride highly enough! Scenery is world class and the amount of pull-offs along it ensures you get plenty of viewing. Seeing the leaves changing color in the fall is a must. The road is well maintained with no commercial traffic, and plenty of small, hidden villages along its length. If you're a fan of twisty roads, make sure you ride Deal's Gap near the southern end of the BRP. The BRP will definitely remind you why you ride a motorcycle. on August 18, 2008 2 out of 2 members found this review useful. I've rode the entire length of the parkway several times over the past few years and it is always a pleasure to come back. When the temperatures in the lowlands are hovering in the upper 90's you will be rewarded with mid to upper 70's on the BRP. Do be aware that weather can change quickly and thunderstorms on the parkway can be very intense with wind gust that will surprise even the seasoned rider when riding along an open ridge. on October 11, 2015 1 out of 2 members found this review useful. Have ridden the Parkway four times so far and will do it every chance I get in the future. Very enjoyable ride. Many great turn outs where you can take photos of your bike next to the sighs and of the scenic views. Also met lots of nice fellow riders at those rest areas. Spring and fall are my favorite times to ride it. Note: Watch for wildlife in the roads and an occasional speed trap. on April 21, 2015 1 out of 1 members found this review useful. The Blue Ridge Parkway was an awesome ride. Nice curves with lots of beautiful scenery. Would love to ride it again. on December 7, 2014 1 out of 1 members found this review useful. It was great. Did it on the way from Toronto to Deal's gap. on May 29, 2014 1 out of 3 members found this review useful. The cons - The speed limit is low, as low as 25 mph near the points of interest. Watch out for wildlife, the deer tend not to be as skittish, but they aren't the only wildlife that live there that could be in the road. When fog hits, it can be thick as pea soup, check the weather since it may be different in the mountains than in the valley. There is no road maintenance, so during the winter or after a bad storm the roads may be closed or there may be fallen tree debris. Check the NPS website for road conditions before travelling. There are not many exits or entrances so plan ahead for fuel and food stops. Don't trust GPS, sometimes it will direct you to an entrance that is non-existent, verify there is an entrance or exit on the map provided by NPS. The pros - It is literally the best parkway I've ridden on the East Coast, and I've ridden them all east of the Mississippi. The curves are sweeping and relaxing. The scenery is breathtaking and there is minimal traffic due to the limited access. The north entrance in Afton can be busy since it's close to I 64 and the amount of hikers, bikers, etc. have a free place to roam, traffic tends to be few and far between the farther south you go. I recommend taking Skyline Drive to get there, it's worth the fee and the road conditions tend to be better. One of my favorite sections is in North Carolina, the Linville Viaducts where the twisty road is attached to the side of the mountain. This is my favorite road to just decompress and enjoy myself without stressing about trucks, or other vehicles (as much) and it works every time. on February 20, 2013 1 out of 3 members found this review useful. on June 24, 2010 1 out of 2 members found this review useful. Great Road and views! Gets a little monotonous. The curves all began to look the same. The constant rain wasn't great also, but it is certainly a road I will remember for quite some time. I would certainly recommend it to anyone who needed a suggestion. on June 4, 2010 1 out of 2 members found this review useful. on October 27, 2009 1 out of 3 members found this review useful. The best stretch on the Blue Ridge Parkway on the NC side is from Asheville to Cherokee. The scenic beauty of the ride is outstanding. I would suggest a lay-over in Asheville before you ride to Cherokee. on September 28, 2009 1 out of 2 members found this review useful. This may be the best continuous mc road east of the Mississippi. Also, don't forget Skyline Drive, the contiuation of the BRP to the NE that ends in Front Royal. While a park fee is charged, and the speed limit is lower than on the BRP, it's really just a contiuation of the best! on August 20, 2009 1 out of 1 members found this review useful. The Blue Ridge is everything you hear - an awesome ride. Scenery, road quality, curves, tunnels, etc. The best part besides the ride itself is the people you meet - fellow bikers all having a great time and ready to share stories. Spent 2 different weeks on the BRP and they were the best times! on July 6, 2009 1 out of 2 members found this review useful. on May 3, 2008 1 out of 3 members found this review useful. Camped on roadway at closed gate on top of Mt Mitchell in July and froze. Ice on sleeping bag in morning. BRP is awesome, deserves taking it slow and easy. on October 21, 2018 0 out of 0 members found this review useful. In mid May of 2017, two other riders Mike and Ed, and I road from Virginia Beach, VA to Floyd, VA. we stayed the night to enjoy the Blue Grass music. And it was good! These groups had it together with the finger picking banjos to the 12 string folk guitarists, they were great to say the least. The next morning we had breakfast, saddled up and headed for Charlottesville, VA on the Blue Ridge Parkway. WOW! It was very beautiful with the ups, downs, lefts, and rights. There was very little traffic and the riding was phenomenal. My spot was bringing up the rear, I would lay back let the two guys a head of me get way ahead. I would bring up the rear following the speed limit of corse, getting into the turns was awesome. The speed limit in most areas was 45 mph, and unless there was a curve with a reduced speed limit sign. I maintained my 45 mph and laid my big ride into the turns and loving every minute of it. WOW what a beautiful road and the cenerary was breath taking. We didn't see much wildlife at all, and I wasn't disappointed with that. In fact I enjoyed that fact because it let me enjoy my ride in every way. We stopped several times at rest areas, we met very nice folks along the way. We even had a quick bite to eat and enjoy the views as we sat at a picnic table. It took us about 3 hours to get to Charlottesville, took another short break. We headed for Interstate 64 East back to Virginia Beach, VA. I had a great weekend with the guys. Thanks for reading, I hope you've enjoyed it. This is one of the most beautiful stretches of roadway in the country, especially on two wheels. Lots of scenery, lots of mountains, and lots of curves. I rode the Blue Ridge from Virginia all the way down into Asheville, NC. As of Aug 5, 2018, somebody decided that it would be a good idea to chip seal about a 50 mile portion of the Blue Ridge in NC, near Asheville. Riders use caution on that stretch!! Taking a sharp curve in freshly laid gravel at a 5,000 ft elevation is not fun! It does not make any sense whatsoever why they would decide to throw gravel down on one of the most popular motorcycle roads in the country. Blue Ridge Parkway HAS to be one of the best motorcycle roads in the U.S.A. It's got beautiful scenery, goes for miles & miles up and down mountains through 100's of turns! it's well maintained and often has no commercial traffic. While mostly 45 mph the parkway is twisty enough that 45 is still a lot of fun and there a plenty of straights through meadows and valleys where you can open it up some (or a LOT if you're into that kind of thing - I road Blue Ridge for over 100 miles and saw 1 police car) A ride worth the trip from anywhere! on July 14, 2017 0 out of 0 members found this review useful. May 19, 2017 I made a trip to Floyd, VA from Virginia Beach, VA with 2 other riders. We got on the Blue Ridge Parkway in Floyd, and rode North to Charlottesville, VA which is about 150 miles. WOW! Talk about beautiful, the BRP roads are in excellent condition, the speed limits are perfect. There are suggested speed signs for all the sharper curves, which is awesome! We made 2 stops, one for photos, and the other for the rest area. In Charlottesville we jumped on Interstate 64 E. it took us 4.5 hours to get back to Virginia Beach. It was an awesome ride, and I would do it again! on April 14, 2016 0 out of 0 members found this review useful. I'm sorry but this map is NOT of the Blue Ride Parkway, zoom in and you'll see it isan't even close to it. on June 22, 2013 0 out of 3 members found this review useful. We've done parts of this many times, and last time we rode from PA, and did the whole parkway. We wanted to see what was at the end. There was a stop sign at the end. Still very worth the ride. From the north, the first 100 miles is our usual ride. It's a great section, roads are pretty well paved and maintained. 100-250 is a smooth, easy ride. 250-350 picks back up & gets a little more aggressive. Nice curves & great views. 350 to the end is a bit of a boring downhill once you've just come of the twisty section. We did the whole thing in 2 days, then headed up to Gatlinburg TN, which an interesting ride itself. One of our favorite destination rides from PA.
on June 18, 2013 0 out of 2 members found this review useful. It simply can't get any better than this. Uncrowded, smooth, winding, cantilevered road front to back and nothing but majestic scenery. Friendly people, and lots of places to stop eat, and sleep. on May 25, 2013 0 out of 2 members found this review useful. on March 29, 2012 0 out of 2 members found this review useful. What a greatride, Don't be in a hurry. 45mph tops (that the speed limit)Stop at the overlooks and enjoy the Mtns, and valleys carry rain gear. on February 10, 2011 0 out of 7 members found this review useful. on August 1, 2010 0 out of 1 members found this review useful. Absolutely awesome motorcycle road. HIGHLY recommend Grandfather Mountain at approx. mile marker 305 on the Blue Ridge Parkway. I started out on Saturday the 17th of July 2010. Took mostly route 81 South to Front Royal Virginia where I got on the Skyline Drive. Road the Skyline Drive and the BlueRidge Parkway down to approx. mile marker 320 and turned around and came back the same way making it home at 10:30 PM Wednesday night at 1501 miles total. In a nutshell, it is absolutely beautiful both from the great condition of the roads to the incredible scenery. The only thing I will do different next time is to note the best exits for gas, food and lodging. And, I will bring my sleeping bag and tent. The coolest twists and turns were on the several hundred miles of little "down the mountain" and "Up the mountain" roads to get gas and food and get back on. Met some really cool bikers from Jersey too. I WILL do it again and camp along side. on March 9, 2010 0 out of 2 members found this review useful. Been riding over 30 yrs. Best long distance ride I ever took. Everything I thougth it would be and then some. Did Skyline Dr. - Blue Ridge Pk. to Gatlinburg with a stop in Mt. Airy, NC. aka Mayberry. Also hit Grand Father Mt. Many things to stop & see along the way. Hope to do it many more times. Pictures can't capture it all you have to ride it. Went in Sept. no traffic, some rain still AWESOME!!! on November 28, 2009 0 out of 2 members found this review useful. I rode the entire length of the BRP back in the fall of 1981 on my Norton Commando 750 (still have the bike!). This ride is definitely one for your personal bucket list if you love to ride. Nothing but turns and beautiful scenery. I rode with another good friend and we met more than a few cool people along the way. It is a ride and a time in my life that I will never forget. And one day, I will do it again. on May 11, 2008 0 out of 2 members found this review useful. Excellent road! I only got a small taste of it, this past weekend. I took Route 60 west towards Buena Vista and hopped on the BRP. From there, I headed north all the way to the beginning at Afton Mt and I-64.